The study of bird behavior is a rich and rewarding field, and can lead to very exciting wildlife encounters. One of the most charismatic and beautiful group of birds are the herons. These water-loving hunters demonstrate a wonderfully diverse range of behaviors when it comes to survival. Some of the everyday behaviors exhibited by a heron may include hunting, grooming, social-interactions, thermoregulation and resting. Hunting meadows. 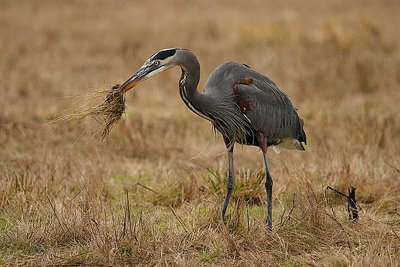 You might not think this is typical heron habitat, but great blue herons are often observed hunting voles in meadows with short grass, especially those near wetland areas. They will stand by a vole runway and watch for movement, then strike with lightning speed and grab one of these fat little rodents. Hunting in dense marshes. One particular heron species – called the American Bittern – specializes in hunting the tall, densely vegetated marshes. These herons have amazing camouflage because of their brown, striped coloration and due to the way they move. Bitterns often imitate the waving of the cattails and reeds when a breezes rustles through them. 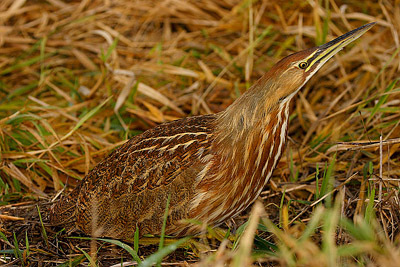 All the while, the bittern is watching closely for the movement of a frog or fish among the dense vegetation. Hunting from a perch. 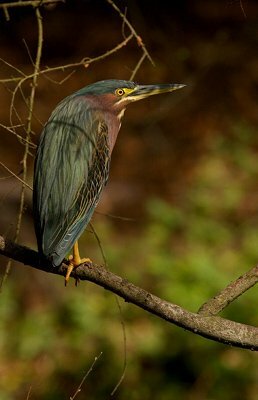 Green herons are small –bodied herons that often hunt from dense branches that are overhanging a wetland area. From here they stalk prey and make stabbing lunges are small fish and frogs. Using their feet. 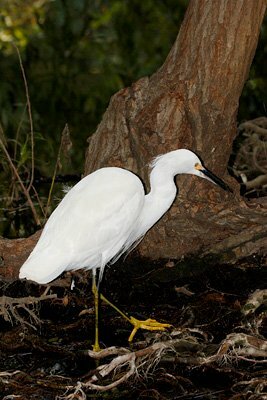 Snowy egrets are brilliant white, medium sized herons that have black legs and yellow-feet. They often use their bright feet to attract or even scare up small fish. When they fish come close, they grab them. Hunting by running. 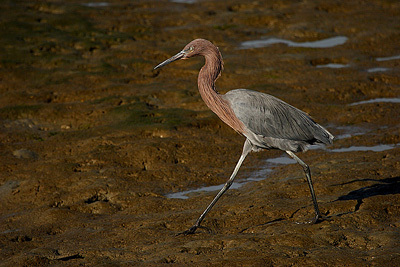 Reddish egrets are a medium sized heron that often catches small fish by literally running them into the shallows. There quick, seemingly erratic dashes send their prey fleeing in front of them. 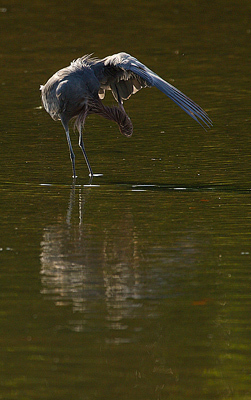 Hunting can be messy business, so another bird behavior you can often observe among herons is grooming. This is their version of daily hygiene, and herons must take very good care of their feathers to survive in the wild. 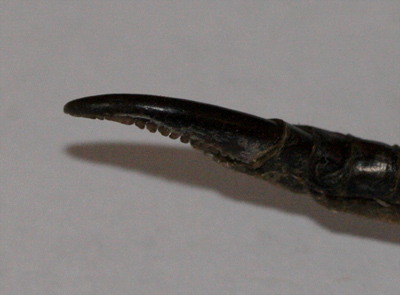 Some herons have a special claw on their middle toe that has a toothed edge along one side. This is the grooming claw, and acts like a comb as the heron runs it through its feathers. Herons also have a patch of feathers on their breasts and on their thighs called “powder down.” These feathers are continuously breaking up into a fine powder, which the herons apply to any slime or other gooey stuff they might get on their bodies as they hunt. The powder absorbs the slime and crumbles away, leaving them relatively clean. They use their grooming claw and beak to help spread this powder down, and they also to remove it when it has done its work. 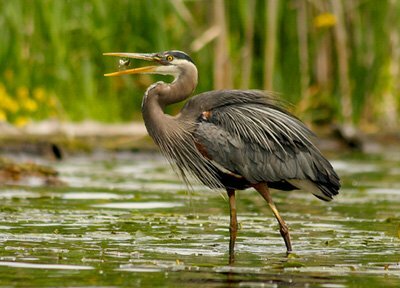 Another common bird behavior to observe among herons is social interactions. Some heron species are relatively tolerant of each other when hunting, while others are not. 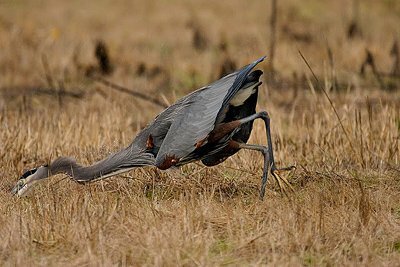 For instance, if 2 great blue herons approach each other too closely while hunting, the dominant one will chase the second bird away. These same birds may have to tolerate each other considerably more when they are nesting, since like many other heron species, great blue herons nest in colonies (called heronries). Herons are devoted parents and in many species, both sexes help rear and care for the young. Another common bird behavior to observe with herons is temperature regulating actions (called thermoregulation). 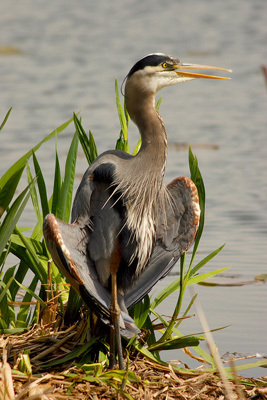 Herons that live in cooler parts of North America may be observed standing in full sun, with their wings down and their mouths open (see below). This is one way for them to control their body temperatures. Although herons are endothermic - or “warm-blooded” - they can’t sweat or shiver the way we can. Instead, they can flutter their throat when too hot, not unlike a dog panting on a hot day. They can also use the extra warmth of the sun by exposing as much of their body to the sun as they can. Herons will fluff up their feathers on a cold day to help trap in their body heat. Herons rest during the day by folding up their neck and sitting quietly in a sheltered spot. At night, many herons demonstrate a bird behavior that might surprise you: sleeping in trees. Many herons sleep in trees at night, to get them off the ground where land dwelling predators might catch them off guard. Observing bird behavior, especially herons, can be a very rewarding activity. There is always more to learn about them. Visit your local wetland areas, especially wildlife refuges and observe some wild birds. Watch closely, ask questions and enjoy!